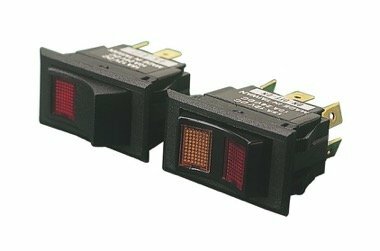 4983?width=380&height=380 3224?width=380&height=380 ILLUMINATING ROCKER SWITCH Stamped Brass/Injection Molded Nylon/Polycarbonate Bulk Display Circuit Action Terminals Amps Volts A B Weight Std. Pack Add to List 420251 420251-1 SPST On/Off 3 Blades 15 A 12 V 7/8" 1-7/16" .04 10 ea 420252 420252-1 SPST Mom. On/Off 3 Blades 15 A 12 V 7/8" 1-7/16" .04 10 ea 420253 420253-1 DPDT On/Off/On 6 Blades 15 A 12 V 7/8" 1-7/16" .04 10 ea 420254 420254-1 DPDT Mom. On/Off/Mom. On 6 Blades 15 A 12 V 7/8" 1-7/16" .04 10 ea 420258 420258-1 SPDT On/Off/On 4 Blades 15 A 12 V 7/8" 1-7/16" .04 10 ea Durable injection molded nylon and stamped brass construction these rocker switches illuminate when in the on position. Installation is easy, simply snap into standard 7/8” X 1-7/16” panel slots wiring with ¼” blade terminals. 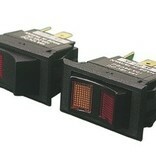 Rated 15 amps @ 12VDC.